If you’ve ever browsed through Diana Madison’s Instagram posts you’ll notice thousands of starry-eyed followers vying to get beauty, fashion or blogging tips from the accomplished fashionista and talk-show host. If Madison’s name doesn’t ring an instant bell, maybe you’ll recall her reporting celebrity news on shows such as The Talk, or The Wendy Williams Show or perhaps you’ve caught her interviewing Hollywood’s most sought-after celebs on the red carpet. We sat down with the entertainment visionary and were happy to see that the fun-loving, kindhearted aura she conveys publicly is quite genuine. We chatted about business, working-mom challenges and got insight into her media achievements and Hollywood beginnings. “I interned at Entertainment Tonight. I got a job there out of college… When I started working at Entertainment Tonight, that’s when I learned everything, and I was there for two years. And then I was like ‘I want to do my own thing,’ I wanted to be a TV host… ” the mom of two recalls. For those that think that success comes easily Madison makes it clear that hard work is fundamental and, in fact, her hustle started at a young age. After college, Madison pursued her dream full throttle. “… nobody would hire me and then I started a blog, Hollyscoop, and that took off,” Madison relives. That was ten years ago and today she hosts AOL’s web show The Lowdown with Diana Madison where she gets in-depth exclusive interviews with Hollywood’s hottest stars. The TV personality actually wears many hats: style influencer, content creator, entrepreneur, producer and our favorite title of all, Mom. She’s also co-founder of Obsev Studios, a digital media powerhouse responsible for content such as Hollyscoop, The Fumble, Obsev Food, Obsev.com, Style Lab and of course her weekly talk show, where she’s number one for entertainment content on AOL On. Overall her massive network reaches over 500 million viewers every month, an extraordinary feat, to say the least. 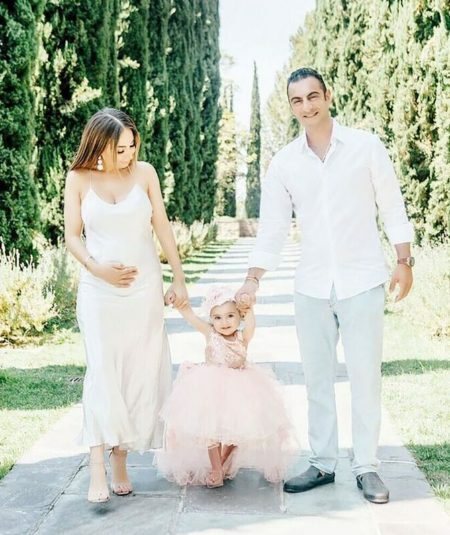 In addition to all that’s going on in her life, Madison and her husband are parents to a beautiful, little girl, Collette, who’s almost two, and she has another blessing on the way. The soon-to-be mom of two plans to work right up until the baby is due, similar to what she did with her firstborn. “Last time I did that I was a week late. And I was working until I went into the delivery room.” The hard-working mompreneur was back at work 2 weeks later! Stay tuned for more great things coming from Diana Madison. The creative visionary is going to make a very special announcement about the gender of her baby any day now on social media!